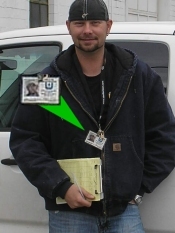 All Service Employees wear an ID tag. You are encouraged to ask to see their ID tag. At Union Oil & Gas, our goal is to make every customer experience an outstanding one. Whether you are calling with a simple question about your service or to report an emergency, you’ll talk to someone who’s prompt, professional and courteous. Dial 304/586-2151. This number is answered 24 hours a day. Even with small projects, like planting trees and shrubs, it is important to call before you dig to make sure you are not digging where there are gas lines or other utility lines. Just dial 811 or 800-245-4848 to reach “Miss Utility of West Virginia”. If you are digging with mechanized equipment, the law requires you call at least 48 hours before you dig. We’re here to help our customers with any question or concern. Customer Service Agents are available from 8 am to 4 pm, Monday through Friday. This email is NOT FOR EMERGENCIES! For emergencies, please call us at: 304/586-2151. This number is answered 24 hours a day.